Paris can be intimidating. It has grandiose sounding nicknames like “City of Love” and “City of Light.” It’s the most romantic, it’s so beautiful, it’s full of locals who will scoff at your clothing and your attempts at speaking French. But in reality, it’s just another big European city and you should treat it as such. Here are some things to do and tips to make you comfortable visiting the great, gorgeous, and totally manageable city of Paris. Paris is really big. And everyone who has been has an opinion on where you should stay. 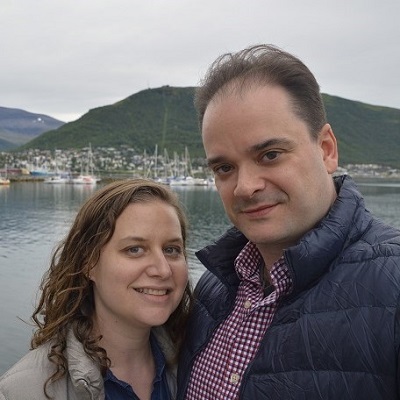 Sarah has been to Paris three times, Justin four – and we have stayed in different neighborhoods every time. A few years ago we stayed near the Eiffel Tower and thought it was great. And most recently we fell in love with Le Marais. We’re pretty sure you’ll find amazing shops, restaurants, and streets to wander wherever you stay in Paris. Just take the time to get to know it. There are always local neighborhood bakeries and cheese shops and interesting buildings and parks wherever you end up. This was our favorite spot to get a croissant and/or a baguette during our first visit to Paris together. Notre-Dame is a must-see in Paris. But, if you want, just see it from the outside. That’s all we’ve done. As we’ve mentioned in the past, we really quite enjoy marveling at beautiful architecture from the outside, and do not enjoy waiting on very long lines. The line to get into Notre Dame is pretty much always long. Once you’re inside, we’re pretty sure it looks like a church. And yes, you can climb up to the top, but Sarah can’t without o2, so we haven’t done it. Just make sure as you’re exploring from the outside you walk all the way around. Of course the best, most iconic view is from the front, but it’s a really interesting, intricate building and you’ll see more of its architecture from different sides. Plus there’s a lovely little park behind it as well. Similarly, the Eiffel Tower is something you definitely want to go take a look at. It’s a gorgeous icon. When we stayed near it, we visited the park beneath it during the day and at night and it was wonderful to see in both lights. But we’ve never had the urge or desire to go up it. It’s really cool from below. Go for it if you’d like, but if you’d rather not, who cares!? At night, the Eiffel Tower puts on a super fun light show. The Rodin Museum is Sarah’s most favorite museum in the whole world. She first visited on her solo trip to Paris in college, and returned this year with Justin. The main building is great, but the highlight is the garden, which is full of Rodin’s sculptures in and among flowers and trees and fountains. You can sit in the garden for as long as you’d like, admiring the art, eating a picnic, or just relaxing. And if you only want to visit to the garden it’s a cheaper entry ticket too. The Musée D’Orsay is in a building that was once a train station. It contains the largest collection of impressionist and post-impressionist masterpieces in the world. As European train stations usually are, the building itself is huge and quite beautiful. In addition to all the incredible art to see, there are many nooks and crannies throughout to explore. Centre Pompadou is Paris’ premier modern and contemporary art museum. And the building is a must-see in and of itself. Sarah loves modern art (not as much the contemporary stuff) and has dragged Justin all over the world to museums showcasing the same artists. But he didn’t complain in the Pompadou. Make sure you see the Stravinsky Fountain which is right next to the Pompadou. We think this is the most beautiful park in Paris. And if you go during prime time, you’ll see so many others agree. It’s a small park lined with lush trees and surrounded by beautiful red buildings. Even if you don’t go in the Louvre, the area outside is still really nice and cool place to take a rest. You can see the iconic Louvre Pyramid or stroll through the beautiful Tuileries Garden. We love walking along water, and there are plenty of places to walk along the Seine River in Paris. Try a little French… or not! Speaking a foreign language in another country is hard. And in Paris, where there’s a stereotype that if you don’t speak perfect French you shouldn’t even bother trying, it can be very intimidating. We can order a croissant or a coffee, but once someone starts asking questions (like “do you want your receipt?”), it’s all over. And even though people will often respond in English after hearing our horrible accents, we still give it a go. We are big proponents of trying. Speaking just a few words or phrases can really enhance your travel experience and endear you to local people (yes, even Parisians). So, give it a shot. And if it doesn’t work out, don’t stress. People speak English in Paris. Just don’t be rude. Starting with “parlez-vous Anglaise?” is always nice. By the way, the cheapest place to drink a coffee is at the bar. We happen to think it’s the coolest too. Paris has an extensive public transportation system including subways and buses. We always find subways easier to figure out than buses, but these days with Google Maps, everything is pretty manageable. The system is far-reaching, so you can use it plus a bit of walking to get anywhere you need to go. We’ve never taken a taxi in Paris (but we try our best to avoid them everywhere). A couple tips about the system… 1) if you’re staying for a few days, get a 10-pack of tickets or a pass to save money; 2) on the subway, hold onto your ticket – you will need it to exit; 3) if you have mobility issues (like Sarah), we’d recommend taking more buses; the subways can be deep, deep below ground and escalators and elevators aren’t common. Tip #4: don’t be like the funny French bunny – watch your fingers in the door! This one might be a bit harder to accomplish, and isn’t specific to Paris, but it’s always nice to see familiar faces in a foreign land. We arranged our trip to Paris this year so that we could surprise our very good friend Eric (with the help of his wife, of course)! Thanks to Liz for capturing us toasting a successful surprise! We’ve really enjoyed going to special events in other countries on our travels. We once created a whole vacation around going to see one of our favorite bands, The National, in Madrid. Similarly, Justin and our friend Chris met in Paris for a long weekend to watch a whole lot of hockey at the Ice Hockey World Championship. And we scheduled our joint trip to Paris around attending the French Open. We devoted a whole day to the event and had a great time. It also helped us learn the public transport system a little more. If you’re intimidated by a destination, having an event to go to will give you a sense of purpose, and can be a great way to get to know the place better. If you’re interested in going to the French Open, you can read tips for buying tickets and attending the matches here! This can be fun in any country, but since Paris is known for its sophisticated gastronomy, it’s a great place to take a cooking class. A few years ago, we took a class with Cook’n With Class. Before the cooking started, we were taken on a tour of the small shops and food stalls in the Montmartre neighborhood to purchase the food for our dinner. We learned a lot about both the area and how to buy food in Paris. Our teacher seemingly created the menu on the spot, based on what was available, what looked good, and what we wanted to eat. We then went back to the school and learned how to prepare a delicious French meal including foie gras, trout, duck (Sarah’s favorite), and creme brûlée. Oh yeah, and a whole lot of wine. It was a super fun, delicious experience. That particular class is pretty pricey (full disclosure, we got it as a gift), but it takes up a full late afternoon and evening, you get a whole lot of delicious food and wine, and learn something at the same time. If you’re choosing between a fancy meal and such a cooking class, we’d recommend the latter. Our friend, Liz, found Poulette by searching for good steak frites. It did not disappoint – it was the best steak frites we’ve ever had. It was also located in a really cool, pretty restaurant that was totally laid back and not intimidating at all. Definitely a great find on her part. Poulette does take reservations. Sarah’s mom recommended Les Cocottes to us and it was fortuitously located right around the corner from our hotel during our first trip to Paris together. There are now two locations. At the time, they didn’t take reservations (not sure if that’s changed), but we didn’t have to wait long the night we went and were seated at the bar (which is a cool place to eat anyway). Everything is served in small baking dishes (which is why the restaurant is named as it is). And everything was absolutely delicious. It’s the least fancy (and expensive) of a bunch of restaurants owned by a famous Parisian chef. We found B.D.J Café by looking on Google Maps. We wanted to eat in the Place du marché Sainte-Catherine, which has a whole bunch of cute restaurants with outdoor seating, so searched for one we thought we would like. We had to wait a little bit, but put our name down, took a short stroll, and then were seated. They have a really reasonable three-course prix fixe dinner. The food was simple but delicious – just what you’d hope French bistro food to be. On our last trip to Paris, we stayed in Le Marais neighborhood. In the old Jewish quarter of the neighborhood is Rue de Rosiers, a street with a whole bunch of falafel restaurants. We perused them all, but ended up at the most famous one – L’as du Falafel – to get delicious falafel sandwiches to go for an early dinner after our day at the French Open. Or our first course at least… we definitely needed dessert. But they would make a perfect lunch. Just note, they’re quite messy, so bring extra napkins! During our month in Japan, we developed a love of okinomiyaki – savory eggy, cabbage-filled pancakes smothered in rich, tangy sauces. So we were super excited when we saw that an okinomiyaki joint was located around the corner from our apartment in Le Marais. OKOMUSU is an extremely small restaurant, so reservations are needed. The food was delicious and the service was as good as in Japan. Justin can strongly recommend Street Bangkok Canteen & Bar, which is located near Place de la Bastille. It’s a street food themed Thai food restaurant with a relaxed atmosphere. The green curry was spicy and authentic. With dreams of eating pho, on our most recent visit, we put a whole bunch of Vietnamese spots on our map. Sadly, we didn’t have time to go to any of them. But we just wanted to make the point that there are a ton in Paris, so if you’re craving that food, you won’t be disappointed. Paris is the best city to have a DIY picnic. Go to individual local shops or one of the big markets and grab a baguette or croissant (or both! ), cheese, meat, fruit, and of course wine. Head over to a nearby park or one of the outdoor spots we’ve mentioned, and enjoy! The fresh food is so delicious in Paris, you can’t go wrong. We hope this post has helped give you some tips about visiting Paris and how to feel comfortable exploring this great city. There’s so much to see in Paris, this is really just scratching the surface. If you’ve been, let us know your recommendations in the comments! This entry was posted in Destinations and tagged Europe, France. I love this! I did find Paris quite an intimidating (and lovely) city. The Pompidou is my favourite museum ever. I go there every single time I’m in Paris! Some really gorgeous photos and great tips on visiting Paris. I agree it is great to see the icons of a city but you should do it in the way that suits you. Le Marais is my favorite neighborhood in Paris too! Did you happen to see a cute thrift shop there across the street from the falafel place? I use to love shopping there. I will admit, I’ve put off visiting Paris because it is a little overwhelming. But your photos of Notre-Dame up-close are so incredible! I think you’ve got some great tips, especially not feeling pressured to visit certain attractions and picking a single neighborhood. These were amazing tips! I love Paris and have been several times – each time it only gets better because I do less of the touristy stuff and just explore for myself <3 Very keen to do a cooking class or attend a special event the next time i'm there though. Thanks for the inspo! This is such a great guide! I agree it’s better to do less than try to pack so much stuff in and always feel like your rushing. You get to enjoy a place so much more if you just pick a few things you really want to see and allow time to soak it in! “See the big sights, but do whatever you want” is such great advice for any destination! Especially in well-known places, there’s so much pressure to see the most famous tourist spots. But I always find I enjoy the places I find myself off the beaten path! Great post and I love that you say things like “if you’re not into art, then don’t go into the Louvre.” As a personal travel planner, I think people feel like they HAVE to do something because the place is known for it. For instance I love the inside of Notre Dame, but get while you are okay with just seeing the outside. Everyone needs to do what they want…not what the guidebook or some travel blog tells them. By the way, the cooking class looks amazing! I completely agree! One of my favourite things to do in Paris is stroll through the parks rather than head to the busier areas. And the Petite Ceinture (abandonned railway) is an amazing place to escape the crowds and slow down. Feeling a need to book a return trip soon.. Honestly, I was intimidated with Paris when I first went there. After a few days of insecurity, I reflected and thought that I won’t enjoy what it has to offer if I kept feeling that way. And so, I was able to appreciate what Paris truly is! So many places to go and I would go back there in a heartbeat! I haven’t seen much and reading this post makes me feel more eager to come back there and explore more of it soon! Thank you for sharing this post! That’s exactly the way I felt the first and second (!) times I visited Paris. But finally on the third visit – after we’d traveled to so many other truly exotic, unique, and intimidating places – I found my groove. We’re going to Paris for Christmas, and this has made us sooooo excited!! We’re staying right near Le Marais this time, after falling in love with it on our last trip there. So many great tips here – I’m sure they’ll come in useful 🙂 Thanks for sharing! Oh that will be a wonderful trip! We hadn’t stayed in Le Marais before our last trip and now I don’t know if I would want to stay anywhere else! So many cute little streets to walk down with nice buildings. Enjoy! Great point about doing what you want to do when visiting iconic cities instead of trying to do everything you’re “supposed” to do! I’m often perfectly content just BEING there, I don’t necessarily have to be DOING anything in particular. Definitely agree with what you’ve written above! Taking the time to explore the neighborhoods of Paris and speak a little French will enable a totally different experience to just visiting the Eiffel Tower and Louvre! There’s so much to explore!